During the Tudor and Elizabethan periods, water-colour portrait miniatures were very popular and the wealthier subjects of Elizabeth I would often wear them as a sign of loyalty. 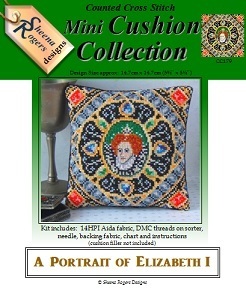 Queen Elizabeth I took great care when allowing miniatures of herself to be created and distributed, and this design has been created with that care in mind and is embellished with jewelled motifs giving a show of grandeur that a design fit for a Queen deserves. Only whole cross stitch it required, with a small amount of backstitch needed for the facial features.